DetectingScotland.com - Metal Detecting in Scotland, UK » Forum » Detecting Discussions » Detector Finds » My DS100 find! Here is my best find of the day! Vesica Seal Matrix! So happy, had a great day out! 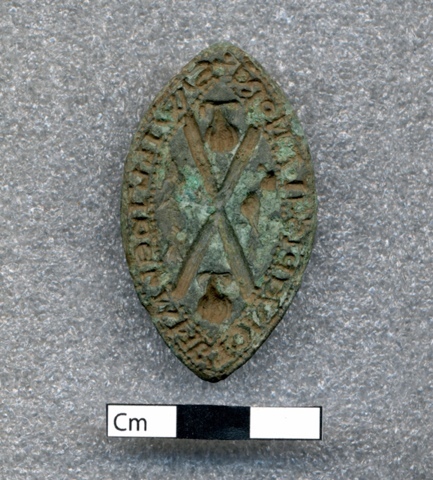 <<<<Finder of William de Lamberton's Seal Matrix c1300, now housed in St Andrews Museum. Well done Abby, thats stunning . ...a very beautiful and exciting find, well done indeed. I can't wait to hear more about it, as the history that can reveal could be fantastic!!! It's really is a thing of beauty!! What a find, well dug! Congratulations, that is a lovely find. Very nice indeed. Well done.